The Sidebar: International first aid throwdown! 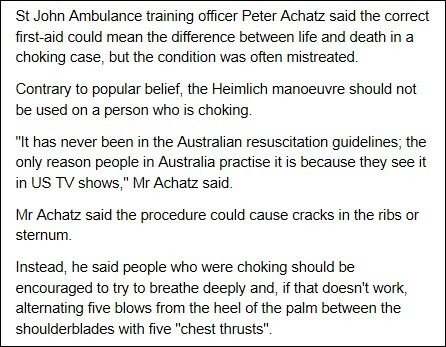 Australia: "NEVER perform the Heimlich maneuver on choking victims." The Heimlich Institute & Surgeon General Koop: "ONLY perform the Heimlich." International first aid throwdown! 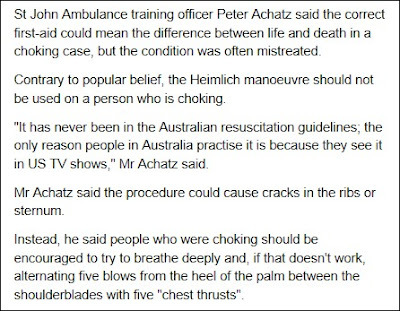 Australia: "NEVER perform the Heimlich maneuver on choking victims." 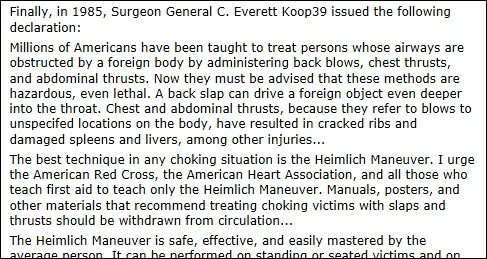 The Heimlich Institute & Surgeon General Koop: "ONLY perform the Heimlich." Ladies and gentleman, welcome to an international first aid throwdown. The prize? Determining the most effective method to rescue a choking victim. All that's missing is a referee. How about the medical profession? Or how about the media? Presumably the press wants to provide the public with the best available first aid information. Also, controversy sells newspapers and this one's got that base covered, plus two world-famous doctors are in the mix. 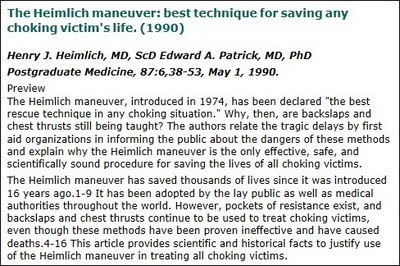 If anyone wants to ask the various players what they have to say to support their positions, click the names for their contact information: St John Ambulance Australia, the Heimlich Institute, and the Koop Institute at Dartmouth College.